Bring a large pan of water to the boil, then cook fava beans with some salt according to pack instructions (8 minutes). Scoop out the beans and peel the outer skin from each of them. Place ¾ of the beans in a food processor. Add garlic, juice of 1 lemon, mint and chopped spring onions. pulse a few times. Add the ricotta cheese, sour cream and parmesan and pulse until smooth. Toast the pine nuts in a dry skillet over medium-high heat for about 3 minutes until golden brown. Meanwhile, cook the linguine in the pan with boiling water according to pack instructions. Drain and place the pasta back in the cooking pan. Stir in the fava bean sauce. Season with black pepper and garnish with fava beans and spring onions. Divide among 4 plates. 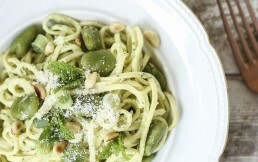 Sprinkle parmesan cheese on top and add the toasted pine nuts.